I have a new favorite ice cream. I'm a big fan of philadelphia-style ice cream that is simply made from a mix of milk and cream. You don't have to bother with egg yolks and cooking a custard. I got a new idea to add sweetened condensed milk to the mix when stopping by Kahakai Kitchen the other day. Here's how I incorporated it. Combine ingredients and freeze according to your ice cream makers instructions. This needed a little something extra so I decided to make a fudge ripple mix-in from The Perfect Scoop, an awesome book on the ins and outs of ice cream making. Whisk all ingredients together in a small saucepan and place over low heat. Bring to a simmer and allow to stay at a low boil for a minute. I had to remove mine from the heat a few times to keep it from bubbling over. If this happens to you, be sure to put it back on the heat as it will thicken better. Once it's been simmering for a minute, transfer to a bowl and chill thoroughly. When you place the ice cream in it's storage container (I use ice cream containers from my local gourmet food shop) layer the ice cream with a healthy drizzle of the ripple. When you go to serve the ice cream you'll be rewarded with layers of sweet ice cream and intense chocolatey ripple. Yum. Enjoy! I love this recipe for ice-cream. I made a similar one, only adding Ghirardelli cocoa powder to it. 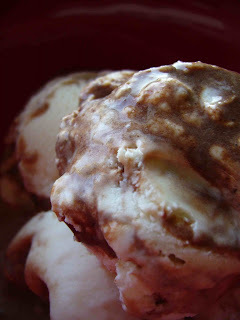 I also found that mixing the cocoa powder with the sweetened condensed milk made this interesting fudge-y sauce. I'm going to try this one out, thanks! Love the new blog.Everything looks so good. Wow! Your ice cream turned out great! I'll have to try that fudge sauce--yum!